My retirement from WPF officially ended at 11:59 PM on April 1, 2009. It’s good to be back! As it turns out, I’m just not that good at golf and I don’t know what else a retired doctor does. I better start working on my swing, I guess! I am excited to see that Karl and Jaime have announced the dates and cities for their upcoming "WPF for LOB" training tour. The training is FREE! but you must register. Check out Jaime’s announcement for the full details and registration links. There’s no easy way to break this news, so I’ll just say it… I’m moving on! After 6+ great years working with this awesome platform, I’ve decided to pursue a new interest. This new pursuit will leave me with little time to devote to WPF. I know this news comes as a shock to many of you, but hopefully once you see my new interest, you will understand. Please know that I still have great fondness for the WPF platform. My decision should not reflect negatively in any way on WPF! Okay, if you must know what is pulling me away from WPF, here’s a sneak peak at my next big thing! Part 2: What about WPF? It’s great to get a little insider insight into the thinking behind Microsoft’s ongoing client strategy. First, I have to give huge props to Microsoft for throwing an excellent party in Vegas this past week! The week was definitely packed with excitement and backed by great content. Be sure to check out the recorded sessions if you were not able to attend Mix09. Yes, this year’s conference felt like it was all about Silverlight 3. I think Microsoft would readily acknowledge that this was by design (no pun intended). And this was actually fine with me, since the Silverlight platform has made such great strides over the past couple of years. It certainly deserves the attention it is now getting. Additionally, I’m a platform guy. So much of what I do now requires a full trust environment with access to platform APIs. Until Silverlight breaks out of the sandbox and allows me to harness platform-specific features (which is not likely in the near-term, since it is so focused on cross-platform reach and a small footprint), I think WPF and I will stay pretty tight. Why bring all this up now? I’ve received a number of… shall we say… "concerned" inquiries lately about the shrewdness of adopting WPF for new or future projects while Microsoft has such an obvious slant toward Silverlight. My honest recommendation to anyone deciding between WPF and Silverlight is unchanged over the last couple of years. The platform has to be chosen based solely on the project requirements. If Silverlight meets the requirements of your project and you need cross-platform reach, then you should definitely target Silverlight. End of story. On the other hand, if you’re developing a full trust, Windows application, you will likely be far more successful with the more mature (and in my humble opinion, more elegant) big sister, WPF. I would also point out that many new features highlighted at Mix09 actually represent nice WPF advances too. I know Silverlight received most of the glory, but new Blend 3 features like Sketch Flow, Behaviors, and the new Adobe importers are actually just as pertinent to WPF as they are to Silverlight. And of course, there was the sneak peak at WPF 4. So what happens down the road "if" Silverlight does reach parity with WPF and it finally breaks out of the sandbox? Should that ever happen, my response to potentially losing WPF would basically be a shrug and a big, "So what?" If Silverlight v.Next++ gives me everything I need for Windows client development and supports the same collaborative workflow as WPF, then why would I (or anyone) mourn the loss of WPF? At that point, I’d be more concerned if WPF *was* still around. Again, let me be clear… I think this latter scenario is a big "If" and should things go in that direction, I don’t think we’re talking near-term. Microsoft can move very fast when the correct motivations are in place, but even at full speed, I think this would be a multi-year scenario. Again, my take is that nothing lasts forever in technology. Both WPF and Silverlight will eventually be replaced by something bigger and better… or maybe smaller and better… who knows? For now, I’m a WPF junkie and a Silverlight user. Yep, three of them! Usually, I only make it through a single puzzle, but I was unexpectedly bumped to first class on this flight where I basqued in the glory of geek icons such as Scorbs, The Gu, the WPF Wonder Man, and even Nate Dunlap! Their collective auras must have increased my puzzle IQ. I often choose to skip the middleman. Instead of using the StaticResource markup extension to look up a converter, I simply derive my value converter, itself, from MarkupExtension. Then I return an instance of it in the ProvideValue() override. I have to assume there are plenty of others using this approach too. (It’s clever, afterall, but that’s about the extent of the hyperbole I’d grant it.) If you’re not one of them, I simply wanted to put it out there as a potential trick for your arsenal. This is much better, to my lazy way of thinking. There’s still time to vote in the Mix 10K Challenge! On my recent return flight from San Antonio, I had the opportunity to tackle one of the toughest games of Sudoku yet. Only 20 cells were given. A typical "hard" puzzle gives you at least 25. 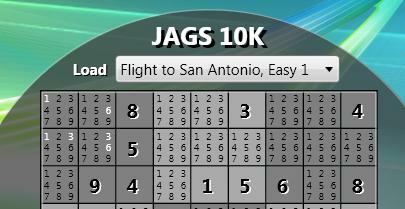 Naturally, I decided to attempt it within JAGS 10K (using the super secret method of loading a custom puzzle described in my previous post). Afterall, every developer should eat his own dogfood! This attempt revealed that the golden release of JAGS 10K is lacking in a very key feature. Namely, there is no way to make visual cues within a cell. Most Sudoku players rely on these marks when solving a puzzle on paper. Without this ability on the computer, solving a tough puzzle is nearly impossible (unless you’re Dr. Spencer Reid from CBS’s Criminal Minds… yes, I’m a fan). Clearly, I had some work to do! As such, I took some time this past weekend to add the required new feature and I’m happy to say that the new release is now available for installation here. All of the original features are still there. You can play an auto-generated puzzle of a specific difficulty or you can load a puzzle from the web. Now you can truly solve any level of puzzle! Enjoy! It took me nearly an hour to solve! Maybe you can beat me. So I’m sure you’re asking, "What did these enhancements do to the size of the code?" As you might expect, it increased it quite a bit. The size of the code actually went up by about 20 percent! My first inclination was to simply release the updated version as "JAGS 12K". But alas, if you can’t play by the rules, you shouldn’t play at all! So I’ve spent the last several nights getting extremely creative in the code. I’m happy to say that the code for this v.2 release is now once again 10K (exactly 10,240 bytes, to be precise). If you saw my original post, you know that it took a lot of work to get down to 10K in the first place. Explaining my latest tricks would take too long, so I’ve decided to instead just post the code for anyone who is really that interested. You can download the project here. Caution: Don’t expect it to be very legible! Anyway, I thought I’d write a little blurb about my recent entry into the Mix 10K Smart Coding Challenge. I did not plan to participate in this contest because of other demands on my time. Then Wednesday night someone mentioned that there were only two days left. I took a quick peek at some of the existing entries and I suddenly got the urge to give it a shot. Not that I thought I could do better… (I know my limitations when it comes to design! ;)) Rather, it was the caliber of other participants that drew me in. Plus, the idea of squishing coolness into a mere 10K of code just seemed like fun. I just needed an idea! 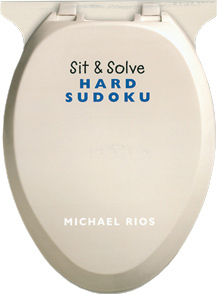 That’s when I saw one of my favorite Christmas stocking stuffers sitting on the corner of my desk… Sit & Solve Sudoku. The shape of this little book says it all! I love a good puzzle! I first discovered Sudoku a couple of years ago when spending a few weeks in India. Now it’s one of my favorite leisure activities when trapped on a plane. Yes, I’m aware there are lots of online Sudoku games out there. But I’ll wager that very few, if any, are written using less than 10K of code! So there was my challenge. And I’m happy to say that I met that challenge. You should be able to check out my entry, JAGS 10K, in the contest gallery shortly. I submitted it yesterday but it has yet to appear on the site. I probably won’t win any awards for this little game, but I’m pretty proud of it nonetheless! I had a blast packing it full of features and whittling it down to size. If you’ve never played Sudoku before, the rules are quite simple… Fill in the grid such that every row, column, and 3×3 box contains every digit from 1 to 9. That’s it! 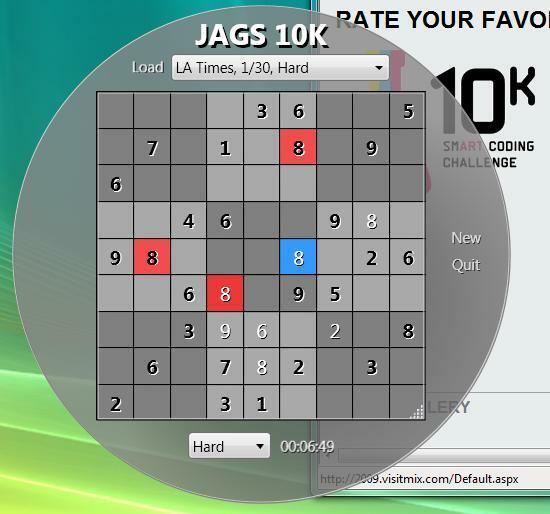 You can play JAGS 10K using the keyboard, the mouse, or both. For keyboard play, simply select a cell using the tab or arrow keys and press the desired number. Press 0 (zero) or Delete to clear a cell. For mouse play, simply click an empty cell and drag the mouse downward to cycle through the available digits. Release the mouse when you find the digit you desire. The application will generate custom games for you, or it can obtain recently published games from the web. Just launch the app, choose your difficulty level, and enjoy! I should also point out that calling this contest a “smart” coding challenge is a bit of a misnomer. I would call it a “clever” coding challenge, at best. (But then they couldn’t play off the “art” in smart, so that wouldn’t fly.) In any event, making an application run in 10K or less involves the intentional implementation of some very poor coding practices! Using these tricks for a production application is not advisable. I began by simply writing the application the way I would any new WPF project. I always start with the view model and an extremely simple view to prove out the view model. This provides a very basic proof of concept app, without the eye candy (styling and visual appeal). I was able to create a very simple Sudoku game in just a few short hours. I used fully descriptive variable names during this phase (since it’s rather important that one understand and easily follow the code they are creating). I also used a brute force algorithm for generating new game boards. I won’t bore you with the details, but I will readily admit that it is inelegant and architected purely to keep the code simple. Once I had the game working the way I wanted, it was time to cut it down to size. At this point, it was about 60K. Clearly, when trying to get under 10 kilobytes, every byte counts! (Literally.) There are some very obvious things you can do: remove all white space, rename all variables using 1 character names, drop all the “private” qualifiers, group similar variables and declare them using a comma-delimited list, etc. After doing these things, I was down to about 20K. The WPF and BlueThong platforms contain a lot of enums with long, descriptive value names. Typing out these names uses up precious bytes. In my code, I instead specified enum members via their explicit integral values, which are easily discovered using reflector. Voila! You’ve just saved 15 bytes! CAUTION: This is one of those shortcuts that you would never want to do in real code! If Microsoft decides to reorder enum values in a future update, the application will surely break. Even in its most compact form, the switch statement above requires 94 bytes, whereas the less optimal series of if statements using known integral values only requires 56 bytes. An instant savings of almost 40 bytes! If you find yourself declaring a lot of similar variables in different methods, consider just declaring the variable once in the global scope of your class and reusing it in those various methods. Remember, its size that matters… not efficiency. When I was looking for those last 100 bytes, I realized that a lot of space was wasted implementing the INotifyPropertyChanged interface on my view model class. Clearly this contains long class names that are out of my control. Even with the white space removed, the above support for INotifyPropertyChanged requires a full 193 bytes. Using this simple trick, I now had full support for property change notifications for about half the asking price (96 bytes instead of 193). Tricky, eh? Visual coolness costs big bytes! Markup-declared animations are very verbose. Styles are really lengthy because of all their Setters. The same is true for the Triggers collection on an element or within a style or template. By the time I had developed the game engine and view model, I had already exhausted the majority of my 10K allotment. I then had to choose very carefully how I would design the actual user interface. I didn’t have room for gratuitous animations or other flashiness. In the end, I decided that my 10K app was more about function than form. (This decision may cost me in the voting, but I’m okay with that.) I was still able to pull off a nice look and feel (using a grand total of 10,195 bytes, or 9.96K) and I’m really happy with the overall product! In fact, I think I’ll bid you adieu now and go play another game of Sudoku! Check out the online PDC session recordings for the goods. 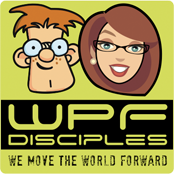 I really enjoyed meeting several of the WPF Disciples face-to-face, some for the first time, at PDC08. We had some good conversations which I’m sure will continue online, so keep your eyes on the disciples google group if you’re interested in such things. And Josh, that is not kool-aid I’m drinking… That is the diluted blood of WinForms developers who have mistakenly questioned WPF’s readiness for LOB. As for the other details in those reports… they were pretty much spot on. I just gave it a whirl, and this is a great tool, especially for a v.1 release. It’s super easy to use and has a very intuitive UI.